The kit is quite easy to assemble and to help you put it together, I’ve made a video demonstrating a board being soldered and tested. The Raspberry Ladder was featured in the November issue if the MagPi Magazine – please read the original article if you can – it has details of the assembly process as well as a picture or 2. Click here for the assembly video via YouTube. So what can we do with 10 LEDs and 4 switches? quite a lot, I hope. This blog entry is just a taster page for it all – software supplied which you can download includes a simple test program (to make sure it’s working OK! ), a version of the ladder program which was the inspiration for this board, the Tuxx Crossing simulator, and some new programs – A version of the “Simon” game, and a reaction tester. These programs are written using Bash Scripting, C and BASIC – and I’ll welcome some contributions written in Python, Scratch, or anything else you may care to use! For more details of the software to drive the board, please see this page. Hi Gordon. I bought the Ladder kit from Tandy (arrived Friday, still in the package at the moment). I was wondering whether it’s possible/easy to assemble the kit on a breadboard rather than solder it onto the circuit board? The reason I ask is that once I’ve played around with it in the ‘Ladder’ format I’d like to try out different configurations/layouts for other projects. Sure – at the end of the day, it’s just LEDs, resistors and switches, so building it on a breadboard is possible. 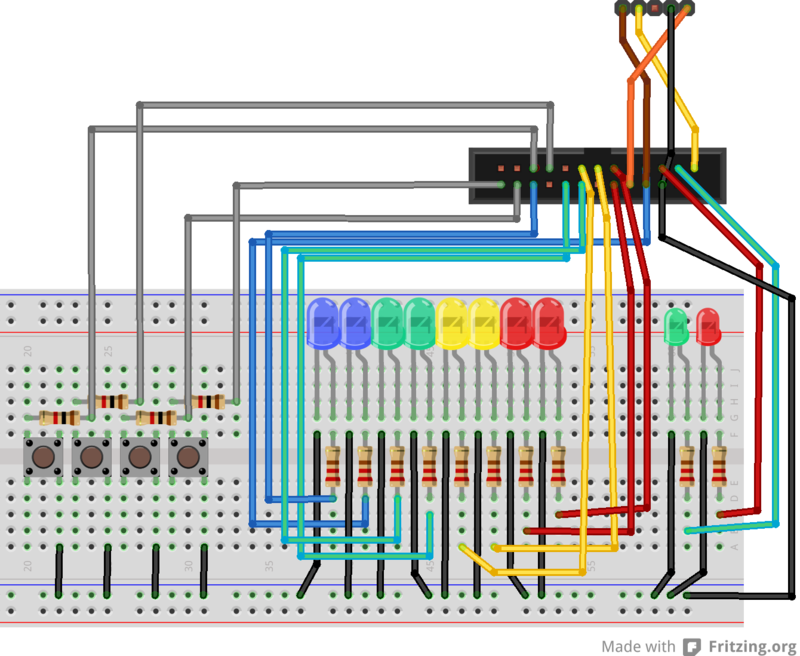 I do have a fritzing diagram of it on a breadboard too – which I’ll post in a day or 2 – temporarily away from my office! Great, I’ll order a breadboard and await your diagram. Thanks for the quick reply. That might get you started..
Just wondering if you managed to find your fritzing diagram? I’ve just built my ladder board, and think I have identified a problem in your latest ladderSetup.sh file. When running ladderTest.sh, at the 3rd stage the green LEDs are always on – it appears because button2 is always 0. I’ve tracked this down to the initialisation for loop for the buttons which in the latest version is “for i in 11 12 13 14”, whereas your first version used $button1 etc, giving an equivalent “for i in 11 10 12 13”. If I change this, all works as expected. I think you might be on to something. Oddly enough I’ve only had one other person report an issue like that, but that explains it fully. Thanks for finding this. I’ll push an updated version shortly. Going through the logs – I extracted bits of the original test program into the ladderSetup.sh file, then used that – something must have gotten lost in the translation along the way! Gordon, just built my Ladder Board, connected it up and am now trying to test it. 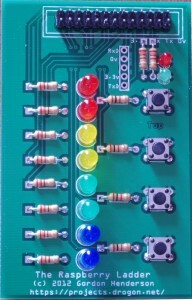 1st of all the small green LED glows dimly but the red one doesn’t, does this indicate I’ve got a problem on the board? 2nd when I try the “git clone git://git.drogon.nedt/wiringPi” command it comes up with the error “connection timed out” followed by “Address family not supported by protocol”. Please bear in mind that although I had a 42 year career in IT I’ve never used a Unix or Linux machine and the last time I used an O/S with a command prompt was on a PDP/1174 in 1982! I feel a bit uncertain because I don’t know what “Git” or “wiringPI” are and I’ve never used “Bash” or “C”. Also when will we see “the real fun starts next month when we start writing some programs for it” article appear, couldn’t see it in the December issue. OK.. Looks like I’ve had a bit of an over enthusiastic firewall at my end – so give it a go again and see if you can do the git clone and build operation. As for the board – Yes, it sounds a bit odd, however do you have the I2C drivers loaded? If so, then reboot without them. (type lsmod and look for i2c names) If they’re not loaded, then both then small red & green LEDs ought to be on, but not at full brightness. I’d start by checking for soldering faults – the common ones I’ve seen so-far have been on the GPIO connector. GIT – A version control system – think rcs on steriods. Network capable. Bash – The command-line interpterter (one of many, but popular). C – programming language. High level, but some don’t think so. The most popular progrmaming language in the world at present. Gordon, thanks for the quick response, I’ve just given it a quick try, still times out. I don’t think I’ve got the l2C drivers loaded, not that I know what they are! I wouldn’t be surprised if there is a problem with the GPIO connector on the Pi, the cable supplied by Tandy is so ludicrously short you can’t get the ladder board flat on a table next to the Pi and the connector on the cable fell apart when I connected it to the Pi, classic case of Tandy “spoiling ship for ha’peth of tar”, I think I’ll have to get a new one. I meant the soldering of the GPIO connector to the PCB is where I’ve seen issues – too easy to short something out. (And Just FYI – this is not the same Tandy of years gone by – it’s the same name, but new people running it, however I’ll pass the comment back about the cable. It should be long enough to get the board flat next to the Pi though. Try the git commands again – there was an issue earlier today which I have sorted and tested though. use the lsmod command to list modules – see if any say ‘i2c’ in their names. 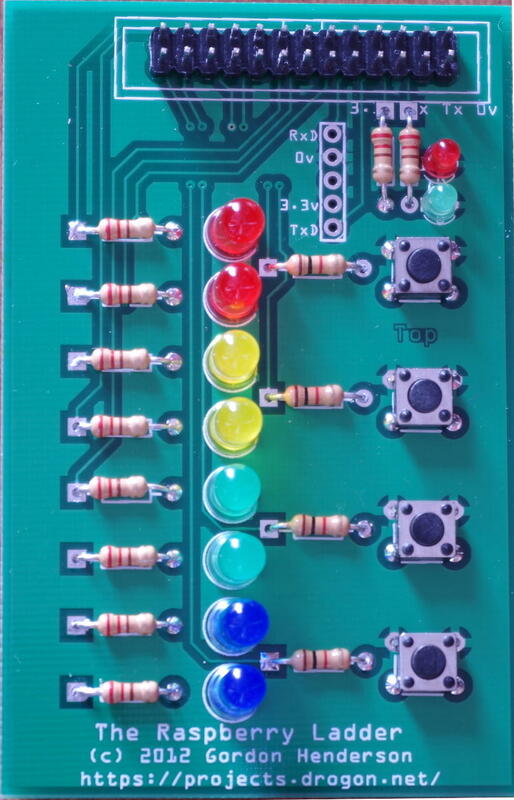 Gordon, many thanks; I’ve got as far as running the test program, the blue LEDs and the small red one don’t light up so I’ve clearly got a problem or two on the board and/or GPIO connector; at least now I’ve got something to work with, many thanks in helping me get this far. You should be able to trace the tracks on the PBC easilly – then use a multimeter to check the track and if it’s shorting to any other pin.